"My favorite lens is the Nikon 50mm f/1.8," says Matt Jorgensen. "My dad suggested that I get a 50mm lens to complement the kit lens on my Nikon D70. I took him up on it mostly because he's usually right about most things and the lens only cost $99." "I soon found myself turning to it quite frequently for candids and low-light shots. 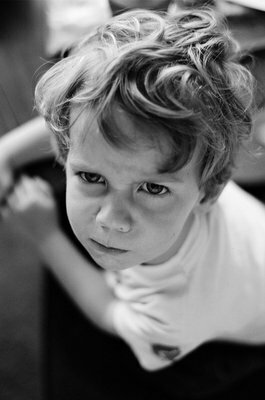 It is fantastic for portraits of my kids when I want a shallow depth of field (see attached shot of my son Lucas). 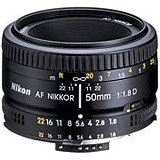 "I also think it improves my photography because it is a fixed focal length lens. I tend to get too caught up in determining the best focal length with zoom lenses and this simple lens seems to make me think more about composition and forces me to move around more. In short, I think everyone should go out and get a low-end 50mm lens. I use mine for both digital and film (Nikon N75 - the attached shot was taken on film)." "For me the extra speed of an f/1.4 lens isn't worth the added cost. An f/1.8 50mm lens costs under $100, is much faster than any kit zoom lens, is small enough to bring along just about anywhere, and will definitely improve your photography." To tell us about your favorite lens, all you have to do is send an email to derrick@thedigitalstory.com with "Your Name: My Favorite Lens" in the subject line. Provide a paragraph or two about why you like your favorite lens so much. Include the brand, focal length, maximum aperture, and camera body you mount it on. If you have an anecdote about your lens, please include it. You may also submit a picture you took with the lens to illustrate why you like it so much. I completly agree, I love my 50mm f/1.8 also, it is my "go to" lens, although I also had to get the 28mm f/2.8 lens for those times you need a little wider angle. I use the D50 and N6006, and they always do great!